This 7.0 cu. ft. electric dryer is programmed has 7 cycles and 12 options. The Electronic Moisture Sensor regulates temperature and time settings for more precise drying. Program settings are done easily with the unitís Express-Select Controls. Over-drying and damaging of clothes are prevented by two dryer features: the Electronic Moisture Sensor and the DrySense Technology. These technologies claim to dry clothes with care. The dryerís 7 cycles include Normal, Heavy Duty and Ultra Delicates, as well as the Quick cycle ñ a 25 minute setting which dries up to 8 lbs of clothes on one load. The Shrink Guard Ultra and Extended Tumble Ultra are two of the dryerís 12 options. Three cycles have the NSF-certified Sanitize setting. The ultra-capacity drum accommodates more clothes, lessening the need for extra loads. It is fabricated from a stainless steel material and equipped with interior light and detachable lint filter. The dryerís Express-Select Control Panel has one-push buttons for easy operation. It also has LED time remaining indicator, cycle indicator lights, Start/Pause/Cancel buttons, Energy Saver button and signal volume control. The unitís reversible door is placed under the control panel. It is a circular door made of clear glass and bordered with chrome. The doorís handle is recessed for a seamless finish. There are different ways to install the unit: it can be perched on top of a companion washer, rested on a pedestal, built-in with a cabinet/countertop or used as a freestanding unit. The stacking unit and drawer pedestal are sold individually. Available colors are Classic White, Classic Black, Classic Blue, Classic Red and Classic Silver. The unit has 7 cycles and 12 options for more drying preferences. The Express-Select Controls is provided for easier program selection. A no-heat temperature setting makes drying heat-sensitive items possible. The Electronic Moisture Sensor monitors and corrects dryer settings when needed. The stainless steel drum is more resistant to rust, thus ensuring more years of use. The NSF-certified Sanitize option kills up to 99.9% bacteria on clothes. Up to 8 lbs. of clothes can be dried in one load with the 25-minute Quick cycle. More choices for laundry care with the dryerís 5 dryness levels and 5 temperature selections. 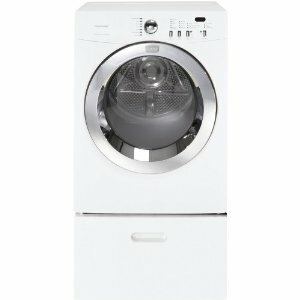 The leveling legs properly level the dryer and minimize extreme vibrations and noise. A Steam cycle, which is useful in freshening up and reducing wrinkles on clothes, is not included in the dryerís cycles. The drying rack is sold separately.